How fortunate we are here in Western New York to have 7 different species of Woodpeckers living amongst us. Important in controlling insect populations, Woodpeckers are greatly served by the presence of dead trees, so leave them standing if they don’t pose a danger. 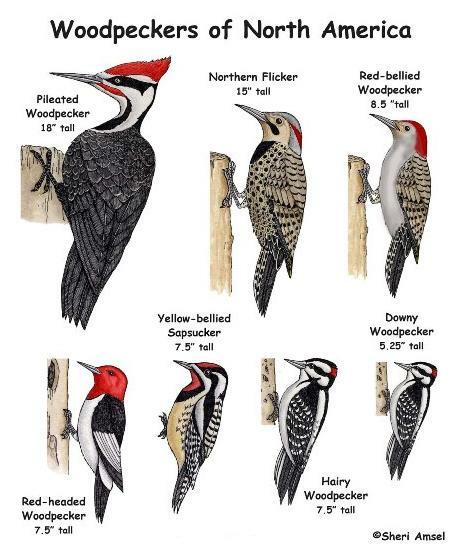 Here’s a little information on each of our native Woodpeckers. Downy Woodpecker (Picoides pubescens): Our smallest woodpecker (at about 6″), the Downy is a common visitor to backyard feeders. You likely hear its location “peep” frequently as it seeks out insects in tree bark. Interestingly, the male and female “hunt” for food differently, with the male pecking holes into the wood and the female lifting up bark. This is due to variations in the male and female bills, the males with one that is stronger and longer; this allows the pair to make the most of available resources. Males also sport a bright red spot at the back of the head. A suet or peanut feeder is a great way to have the Downy as a regular visitor, especially in Winter. Yellow-bellied Sapsucker (Sphyrapicus varius): One of the migrating Woodpeckers, this bird is second smallest at between 8 and 9 inches. Its belly is more a buff color than yellow and males and females are distinguished by the throat patch (males-red/females-white). Both genders have a red patch on their foreheads. Sapsuckers drill deeply into trees to exude the sap. While they do drink up some sap, there is also an ulterior motive. The sap attracts insects so a Sapsucker will “tap” the tree and then return a short time later to feast. They make regularly spaced and aligned holes on trees so it’s easy to see if a Sapsucker has been harvesting. Birch and Maple are among their favorites, but it is not uncommon to see them on fruit trees. In early Spring, watch for Hummingbirds following the Sapsuckers. The sap drawn by the Sapsucker is vital to “Hummer” survival before flowering begins and they feast upon the sweet liquid. Hairy Woodpecker (P. villosus): Looks almost exactly like the Downy except 1/3 larger at 9 inches. Also common, this species has a louder “peep” and often signals warning with a repetitive, steady call. Quite the scavenger, this Woodpecker serves trees well by devouring many destructive insects that live within them. Also easily attracted by suet and peanut feeders. Red-Headed Woodpecker (Melanerpes erythrocephalus): More of a rarity in our area, this migratory species is hard to miss, should you be so lucky to have one in your neighborhood. At about 10″, this Woodpecker has a solid, deep-red head, white underparts and black back (with white wing patches). It has a very long bill which is used to store nuts and acorns in deep crevices. They also feed while in flight, swooping across open fields in search of flying insects. Leaving dead snags and trees is beneficial for this species which they will use for nesting sites. Red-bellied Woodpecker (M. carolinus): Much more common than its Red-Headed cousin, the 10″ Red-bellied minimally migrates so can often be spotted in Winter here in WNY. Besides the usual insects, this one also enjoys nuts and acorns, plus wild fruit, and uses its long beak to cache food. The female is distinguished from the male by having red on only the back half of its head. The lower belly is where the red feathers occur and it is much more predominant on the male. Northern Flicker (Colaptes auratus): Our second largest Woodpecker, (~12″) the Northern Flicker is more often heard than seen. However, if you’ve an ant hill on your property, don’t be surprised to find a Flicker dining excitedly. This behavior sets them apart from their cousins as they are the only Woodpecker to feed regularly on the ground. 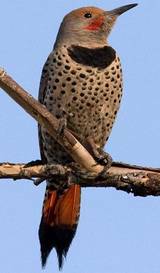 Flickers have a loud repeated “wacka wacka” call and a long, clear “whistle” in their vocal repertoire. They are easily distinguished from other Woodpeckers by their brown coloration and dark brown “bib”. Males have a larger, dark red patch at the top of the neck than do the females as well as dark brown cheek stripes. Interestingly, the Northern Flicker varies from east to west in its range. In eastern territories, the feather shafts are colored yellow where in the western areas, they are red. 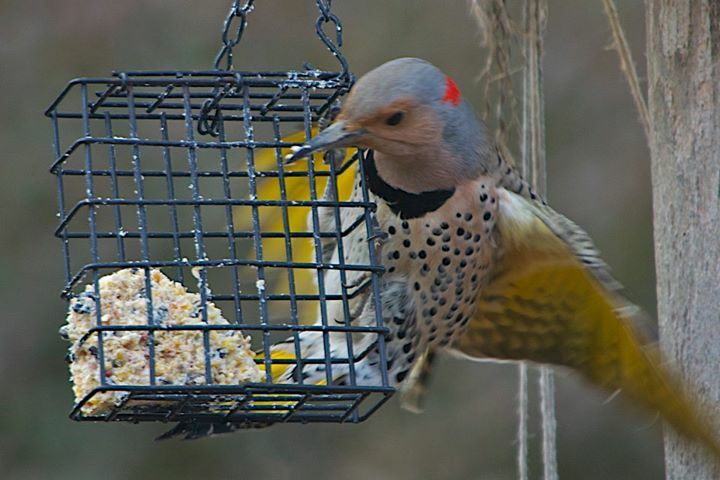 This is why the variety found in Western New York is also called the Yellow-shafted Flicker (see below). These birds are generally migratory in our area. Pileated Woodpecker (Dryocopus pileatus): The “king” of Woodpeckers in our area at ~17 inches. Most people are quite surprised at the size of this bird when initially spotted. However, like the Flicker, it is more often heard than seen and generally found in mature forests. However, if you have that type of habitat nearby, you can easily draw the Pileated to your property by leaving dead trees standing. Tracking Pileated territory is easily done by seeking out the large, rectangular cavities that this Woodpecker excavates in dead trees in its search for food, carpenter ants being among its favorites. The call is similar to the Flickers but has a different cadence and rises and lowers in volume. Males are distinguished from females by their red-striped cheeks. A female Yellow-shafted morph of the Northern Flicker, common in the eastern portion of the bird’s range. A male Northern Flicker in its red morph, which is found in the western portion of the bird’s range.